Alford, 48, was chosen to represent the North Carolina Automobile Dealers Association in the national competition, one of only 57 auto dealers from 17,000 nationwide, nominated for the 44th annual award. The award is sponsored by TIME in association with Ally Financial, and in cooperation with NADA. A panel of faculty members from the Ross School of Business at the University of Michigan selects one finalist from each of the four NADA regions and one national Dealer of the Year. 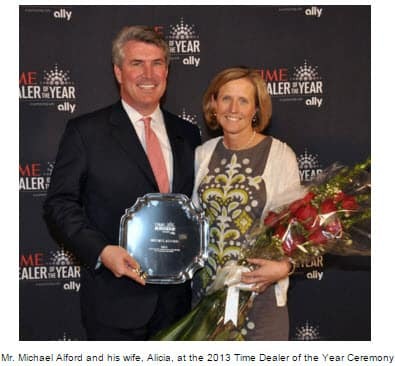 “I attribute much of the dealerships success to our employees,” said Alford, the national TIME Dealer of the Year. 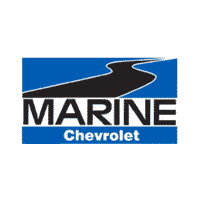 Since acquiring Marine Chevrolet, by far the most rewarding aspect of the journey has been the professional development and advancement of our key personnel. In its second year as exclusive sponsor, Ally has donated $1,000 on behalf of each of the 57 dealer nominees to local community causes chosen by the individual dealers. In addition, the 2013 national TIME Dealer of the Year winner receives a $10,000 contribution for a 501(c)(3) nonprofit organization of his choice. And new this year, Ally is donating $5,000 to each charity selected by the three regional finalists, as well as by the state Automotive Trade Association Executive (ATAE) who nominated the 2013 winner. All nominees are featured on the recently launched website, AllyDealerHeroes.com, which highlights the philanthropic contributions and achievements of auto dealers across the United States. The TIME Dealer of the Year award is one of the automobile industry’s most prestigious and highly coveted honors. Recipients are among the nation’s most successful auto dealers who also demonstrate a long-standing commitment to community service. Alford received this highest honor out of a select group of dealers from across the country recognized at the 96th annual National Automobile Dealers Association (NADA) Convention & Exposition in Orlando on Saturday. The announcement of this year’s national TIME Dealer of the Year and three finalists was made by Brad Young, chief marketing officer for TIME, and Tim Russi, president of Auto Finance for Ally Financial, at the formal opening of the convention, which was expected to draw more than 20,000 individuals involved in the automobile industry. A 1982 graduate of Virginia Episcopal School in Lynchburg where he excelled in sports and academics, Alford was named a John Motley Morehead Scholar (now Morehead-Cain Scholar), a prestigious honor at the University of North Carolina Chapel Hill. Today, he serves on the regional selection committee for the program. He graduated from UNC in 1986 with a BA in political science. He carved out a career in real estate finance, working as a banker until his father-in-law offered him the opportunity to join the family business in 1992. Alford purchased Marine Chevrolet in 1997. I worked in each of the five company departments while attending the NADA Dealer Academy, he said. I credit the academy with helping to immerse me into the nuances of the automobile industry. Since arriving in Jacksonville, Alford has worked hard to make a difference for his employees and the community, which is near Camp Lejeune Marine Corps Base. One of his proudest accomplishments was creating the Military Growth Task Force in 2007, assembling leaders to address social and infrastructure needs following a Marine Corps expansion that resulted in 83,000 new residents to the region. To date, 76 percent of the group’s recommendations have been accomplished or are being addressed. According to Alford, This collaborative effort involving representatives from our federal, state and local governments, as well as civic, military and business leaders was a first. In 2010 Alford was appointed to the North Carolina Board of Transportation. He has also served in leadership and advisory roles for many organizations, including Jacksonville/Onslow Committee of 100 (economic development), Jacksonville/Onslow Chamber of Commerce, JobReady Steering Committee and the United Way, for which he broke fundraising records in his county while serving as campaign chair. And he makes scores of annual contributions to local and national charities. For his altruistic works, Alford was named Civic Honoree in 2011 by the Jacksonville/ Onslow Chamber of Commerce. “I am grateful to have had the opportunity to contribute to the community and state that has given so much to my work family and my immediate family,” said Alford. Alford was nominated for the TIME Dealer of the Year Award by Robert Glaser, president of the North Carolina Automobile Dealers Association. He and his wife, Alicia, have three children. TIME is a global multimedia brand that reaches more than 50 million people and includes the domestic and international magazine editions, tablet versions for iPad, Galaxy, Kindle and Nook, TIME for Kids, TIME.com and mobile. TIME.com draws nearly 10 million unique visitors a month and has more than 4.2 million Twitter followers and over two million Google+ followers. TIME leads the mobile app space with more than 4 million total app downloads across all platforms, including iPhone, BlackBerry and Android.